Growing up I have always adore diamonds, I will take diamond jewelry in any shape, and size. As a modern savvy gal, I have decided early on I will not wait for a man to give me jewelry. Actually most of the gals I know buy their own jewelry pieces. That was why on my 30th birthday, I got myself a major piece of diamond jewelry. I think I must have been temporarily insane to hand over my credit card, but I am still very happy today. The other night, gal pal called me to ask my opinion on diamonds because she was looking to buy her first set of diamond stud earrings. She wanted to know if she should buy diamond solitaire or cluster studs. 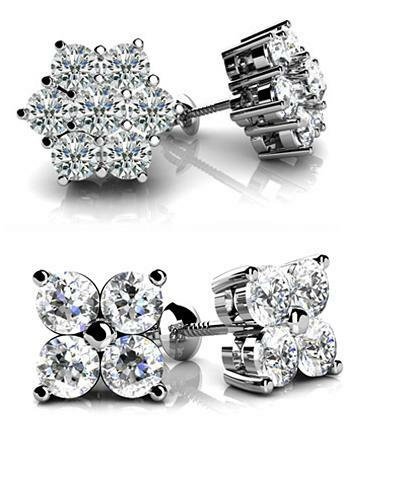 Personally, for everyday wear, I prefer diamond cluster studs for the casual elegance and lower price point. I got this pair few years ago while on vacation and found myself wearing them quite frequently. Gal pal liked the cluster idea to save money but we still liked the idea of solitaire studs. We began to discuss the merit of solitaire studs. As many know by now, my first choice will be bezel set diamond because this setting has a way of making the stone looking larger than the actual carat. Both of us agreed solitaire studs are simple, and will literally pair perfectly with everything. And, just like every girl dreams of a classic Chanel bag, we do the same with that first pair of classic diamond studs. However a decent pair of solitaire studs will be pricier. I am going to have gal pal look at earrings on Anjolee so she can shop for earrings according to her budget and taste. This way, she can play around with gold choices, diamond size and quality to suit the wallet. I shopped on the site. It was more fun than shopping in the store because there wasn't an impatient salesperson. The first pair of flower cluster diamond studs (similar to my earrings) @ .84 tcw, F/G color, VS clarity, excellent cut, and set in 18k white gold will cost $975. The price isn't half bad at all. 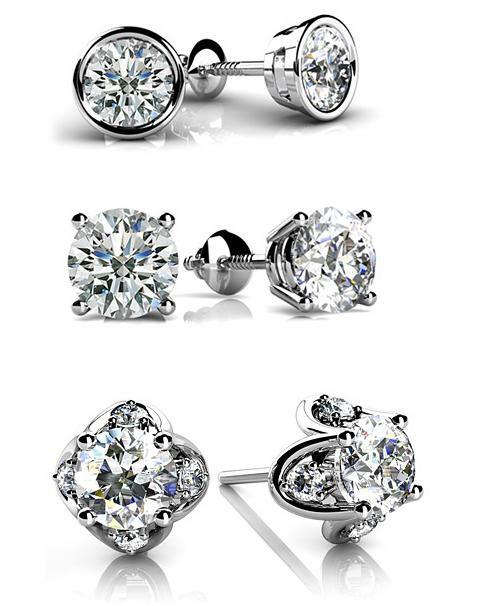 The bezel diamond stud earrings @ .76 tcw, F/G color, VS clarity, excellent cut, and set in 18k white gold will cost $1687. The price isn't half bad at all. Because of the setting, the stone will look decently large. I tried on a pair similar in size at Saks last month and was rather pleased with the size, but not the price. To be honest, I like both because each has its own uniqueness. Each style will serve a different purpose. I guess it really all depend on the budget when a gal is ready to purchase. For me now though, I am leaning toward solitaire stud because I have enough cluster diamond earrings. It is time to upgrade. So are you Team Diamond Solitaire or Team Diamond Cluster?? These are both gorgeous cluster or solitaire. I think your friend has a tough decision to make! Same as you, I have decided there is no point in waiting for a guy to buy you diamond jewelry, enjoy! I love both! ;) I´ve been buying diamond cluster studs since long ago because they´re much cheaper and I love their designs. My one and only solitaire ( a very tiny one)is part of my wedding ring set. I prefer diamond cluster earrings in yellow gold. But personally, I would have custom made double drop earrings, they are chic and more unique than the clusters or studs. Tough decision, but I think if you're going to buy diamonds, why do it half assed? Get the solitaire! I have diamond cluster earrings, and now I am really lusting after a pair of solitaire. I have one question for you... How do you feel about buying branded (Tiffany) vs unbranded jewelry when it comes to diamonds? For diamond, I am not a brand buyer because a diamond is a diamond to me, unless there is a specific design that I love. I won't buy brand. I really don't see a difference between brand solitaire earrings vs. non-brand. Both look the same to me. I will care more about the quality of the stone instead. With this being said, buying brand is also about emotion so it is really up to the individual to determine what is important and comfort level. Just wanted to point out that Anjolee also has cluster diamond stud earrings in addition to the lovely choices you highlighted in this post. They are under our 'Designer Diamond Stud Earrings Category"! Its tough because both have great qualities. Its mainly depends on your budget. But Diamond Stud Earrings solitaire is best option.